The Seeni Sambol Burger was the second breakfast item my wife and I tried on our trip to Sri Lanka in July 2014. I reviewed the Omelette Burger a couple weeks ago, and although this review is a bit delayed, I've been looking forward to writing this once since I first tried this burger almost a month ago. 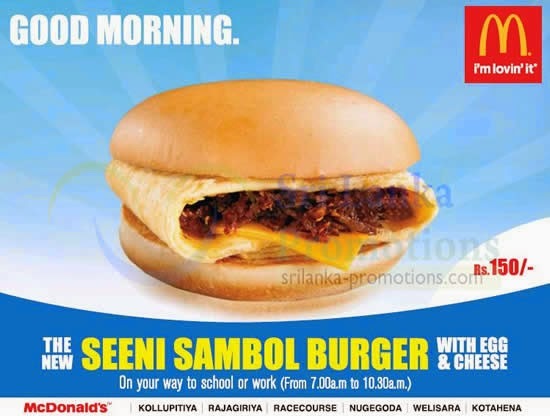 Since both breakfast burgers were tried on the same day, go back and read the Omelette Burger review for more background about the Sri Lankan McDonald's experience, as this review is going to be all about the burger! Once we had our order and were able to open it up and get a look at the inside of the burger, it still didn't lead to any answers. In fact, after giving the burger a first cautionary smell, it actually led to more questions. Although the same expertly folded egg from the Omelette burger was there, inside the egg was 3/4 of a slice of cheese (I wonder what they do with the extra 1/4?) and a dark, still unidentifiable sauce. My wife (as always) took the first bite, and passed it over to me before telling me her verdict. I took my first bite, and before I could distinguish any noticeable flavours, I was hit with a mouthful of spice! Finally, a burger which was actually spicy! They didn't even give it a pretentious name, or promote some "extra spicy" sauce which turned out to be a slightly peppery mayo, this was spicy exactly like you want South Asian food to be. Immediately after the spice, you were hit with strong but very pleasant dried fish taste. My wife thought it was anchovy at first, but although I've become a big fan of dried fish of any kind living in Asia, I've never been a fan of anchovy particularly, so I assumed it was another fish. After I looked up the recipe for Seeni Sambal online, I found that its specifically "Maldivian Fish" which is type of cured tuna. But cured tuna isn't the only ingredient by a long shot. The Seeni Sambal Burger was also heavy on the red onions, which are traditionally cooked in coconut oil with garlic, sugar and tamarind. The onions were fried just enough where they were still crunchy, but not raw. The sugar gave the sauce a required stickiness, but not enough to make it sweet at all. Since the Sambol was so flavourful, that I hardly noticed there was cheese in there was well. I'm pretty certain that this is the only McDonald's which serves a cured tuna omelette burger...for breakfast! This is one of those hidden regular menu items that I really enjoy being able to find and review. This wasn't a promo burger, it wasn't trying to be anything special to get people through the door. This was simply to cater to the local palate. I wish I can find more burgers like this, and it'll definitely be having another of these the next time I pass through Colombo. FYI, seeni is onion in singhalese. so basically its onion sambal, the fish is there for that appetising umami taste. erm .. NO actually, seeni is sugar in Singhala. Luunu is onion. Seeni is sugar. Seeni sambal is made with sugar added. the caremelised onion makes it even more sweeter.